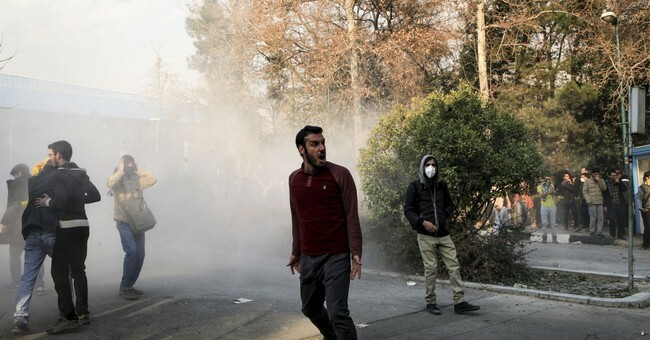 Two Iranian anti-government protesters have been killed, after three straight days of demonstrations against economic unrest and the Islamic regime. According to Fox News, these deaths come after the Iranian government warned its citizens that anybody who participated in an "illegal" gathering “must be responsible for their behavior and pay the price." "On Saturday evening, there was an illegal protest in Dorud and a number of people took to the streets responding to calls from hostile groups, leading to clashes,” said Habibollah Khojastehpour, the deputy governor of the western Lorestan province, according to Sky News. “Unfortunately in these clashes two citizens from Dorud were killed." Khojastehpour claimed that "no shots were fired by the police and security forces” and “foreign agents” and “enemies of the revolutions” were responsible for these deaths. However, according to the Associated Press, the Iranian state government has blocked various social media sites, as well as a popular messaging smartphone application called "Telegram." The state claims it is doing so to "maintain peace." Demonstrators were using these apps to communicate effectively with each other, which is how the protests quickly spread to more than 20 cities in the middle eastern country. By effectively limiting its citizens' free speech, the Iranian government indicates that it will not loosen its grip and control any time soon. TEHRAN, Iran (AP) - Iran state TV says authorities temporarily block Instagram, messaging app Telegram to 'maintain peace' amid protests. Early Sunday morning, President Donald J. Trump doubled down his support for the Iranian people who are demanding freedom from the oppressive government that has been in power since 1979. In total, at least 50 protesters have been arrested since Thursday.